In this video Blake Adsero demonstrates the stone polishing, Master Wholesale Marble & Granite Economy Wet Polishing Kit. 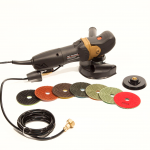 This stone polishing kit comes complete with a Blaster variable speed wet polisher for stone, a 7 pc. RockMaster Standard Wet Polishing Pads kit- Grits: 50, 100, 200, 400, 800, 1500, 3000, and a 4" Wet/Dry velcro pad holder. The Economy Kit is a great polishing kit for the weekend craftsman, or tile setter looking for an inexpensive stone polishing starter kit. This entry was posted in Instruction and tagged tiling, flooring, wet polishers, RockMaster, polishing kits, wet grinders, stone polishing, master wholesale, wet polishing pads, tile setting, grinding kits, granite polishing on July 15, 2016 by mwhoadmin. In this video Master Wholesale President Blake Adsero demonstrates the Master Wholesale Marble & Granite Polishing Kit! 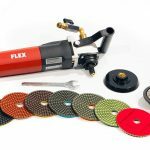 This kit comes complete with the Flex LW1503 Professional 4" wet polisher (3700RPM), a Quick connect hose, the RockMaster Premium 7 Piece Wet Polish pad Kit (Grits: 50, 100, 200, 400, 800, 1500, 3000), a 19" long tool box for storing all the gear, a pair of safety goggles and ear protection, a Master Wholesale Waterproof Apron, a 4" wet pad holder, and a How To DVD. This is the perfect kit for getting started on a home project or for the tile and stone professional. We also recommend a clear flexible connector hose (sold separately) which makes it much easier to handle, rather than having a hose connect directly to the grinder. This entry was posted in Instruction and tagged flooring, RockMaster, flex tools, stone polishing, master wholesale, Flex grinders, wet polishing pads, tiliing on July 13, 2016 by mwhoadmin. In this video Master Wholesale President Blake Adsero takes the MWI (Master Wholesale Inc) Flex LW 1503 Wet Polishing Bullnose kit to task on a set of three stone tiles. 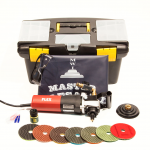 This kit comes with the flex grinder polisher, a 7 piece set of RockMaster Premium wet polishing pads, a 4" wet/dry velcro pad holder, a hose quick-connect, a plastic tool box and a 3/8" RockMaster demi-bullnose router. Blake also recommends the flexible hose attachment with quick-connection which is sold separately. This entry was posted in Instruction and tagged flex tools, wet grinders, wet polishing, flex lw 1503, bullnose grinder, stone polishing, RockMaster Polishing Pads on July 12, 2016 by mwhoadmin.